I'd make an army if I had the money. This is going to be fairly image intensive as I'm going to be explaining the finer points of some simple techniques to improve the quality of your GS work. 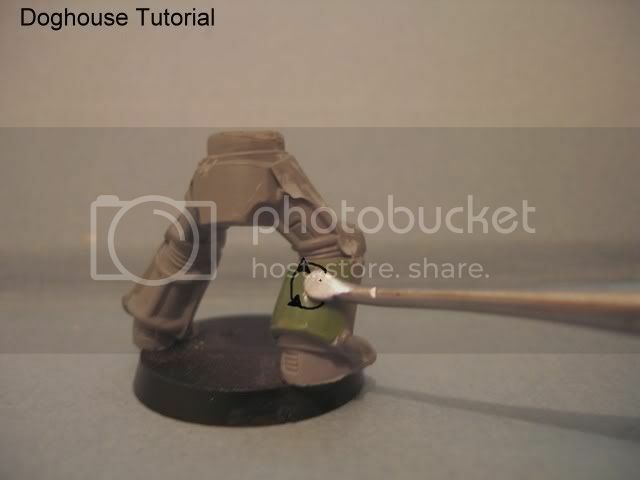 I used the following to work with the green stuff, a simple GW style sculpting tool and a small tub of vasalene. The trick to working with vasalene is to apply it to the flat underside of the rounded end of your sculpting tool by lightly dabbing it in the tub and then wipe it on a spare bit of cloth or rag. Avoid doing this with tissue as fibres may attach to the vasalene, ideally you want a thin greasy film or residue left on the end. You can do the same with water but in my experience this is the best technique to use. 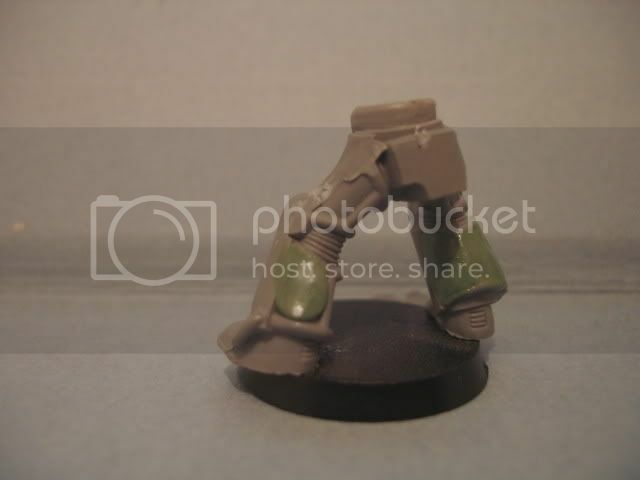 First off you need a pair of plastic Terminator legs. For the time being I want to keep the tutorial simple enough for everyone to have a bash at regardless of skill level so I'll be making an MK VII style marine. The first thing that I have done is to base the legs on a standard infantry base, this is more of a personal preference than a rule of thumb. I like big marines but prefer them to be based correctly. Once that's glued in place and dry I've cut the top of the rounded part that connects to the torso flat in preparation for the torso later int he tutorial. I will be demonstrating how to sculpt the entire torso but don't feel that you need to do that if you're not up to it. 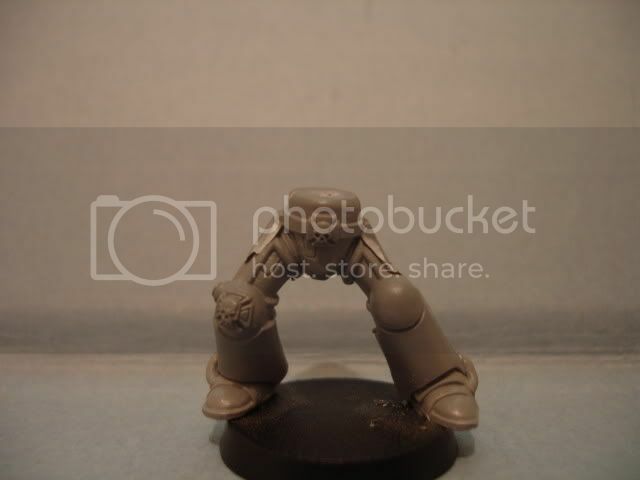 You could use a regular marine torso at a pinch if you wanted to but he'll be a bit thinner and not as imposing. As you can see here I've removed the thigh plates at the top of the legs. This isn't one hundred percent neccesary really but as I'm going to be demonstrationg how to model the thigh armour it suits my needs here. If you want you can just work around them. The Greaves are the lower half of the legs, the large armoured part of the leg that protects the shins and partially covers the feet. The key to making the legs is that it's basically filling in the gaps on the terminator legs. we place a blob of GS and then WHAT?? GAH! You PM me and I give you the details of an off shore account where money can be deposted to get me to finish the tutorial! I'm working on it right now mate as I type, just uploading the images. To achieve this look you need to use the following techniques with the sculpting tool. As I'm self taught I don't know the technical terms that are used so will be using my own to describe my methods. Using the flat rounded end of the tool you roughly press the GS in place pushing it out to the edges to fill the gap. Don't worry about filling it all the way if there isn't enough GS as you can add another blob whilst it's still wet and work it in by smoothing it out. The technique for creating sharp edges is fairly simple and we'll be looking that in the next part. To get the GS smooth you can used the following methods using the round end of the sculpting tool as seen. These techniques are best used for large flat areas but can be adapted for other means. This is a simple method for getting the area flat and for spreading the GS out. It's just a simple matters of pushing the GS outwards towards the edge and moving the tool in an up and down motion afterwards to flatten it out. Some pressure is applied at first but at it takes shape less pressure is used. 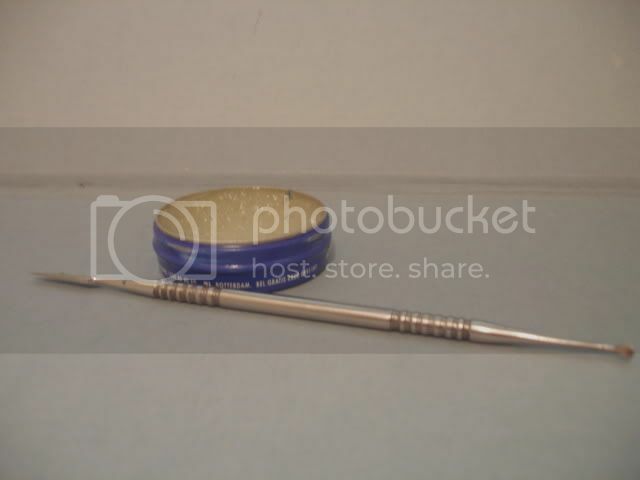 This is the second step and a good one for getting that smooth surface that you are after. Both techniques here (rubbing and smoothing) use the vasalene method and are done straight after applying the GS. Smoothing can be done anything up to fifteen or twenty minutes after the model has started to cure. In fact it is worth coming back every five or ten minutes for the first twenty minutes to smooth the GS areas over again. To smooth the GS lightly move the tool in a circular motion over the areas. Concentrate on small areas at a time and only apply extremely light pressure. Before moving on with the main tutorial I'll add some bits about forming hard edges. I'm all in favour of keeping dangerous weapons out of the hands of fools. Let's start with typewriters. Niceone mate, im in the proccess of having a go at true sclae as well as inspired by synapses awomse chunky true scale dudes. 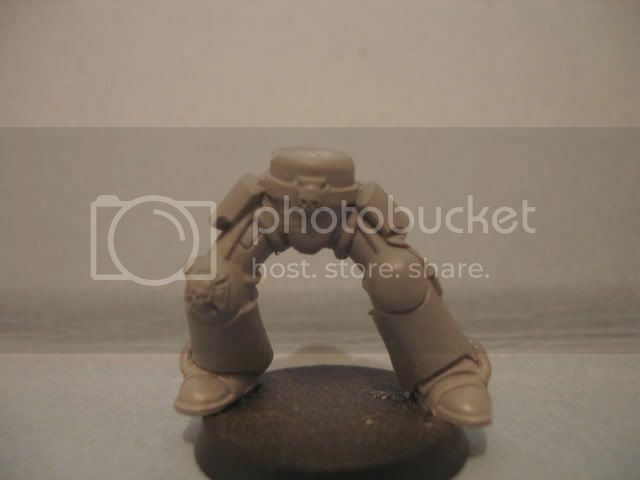 Just a quick bit I thought id point out about true scale is that marine thighs are one of the most out of proportion. Quick tip with anatomy is that for the arm if hanging down will come to rest (the hand) about halfway down the thigh. I dont know if you knew that or not or just hadnt gotten to it yet but yeah its one of my rule of thumb things I keep to when playing with scale. Waiting for some more from you, Ill definatly be following : D true scale are the new awsomeness! Thanks guys, more to come asap. StratoKhan: No problem, it's always a pleasure to contribute to the B&C! klown: Yeah I know the ones, his design is based on mine. The main problem with his version is that are too tall as he once admitted to me. I did a lot of work on the proportions for these guys and consulted Philip Sibbering about scale and size before going ahead with them. That's not a slur on Synapse's work though in any shape or form, he's an excellent sculptor, we get on really well in our posts and I can seriously see him going on to do great things. My guys stand at roughly seven foot six which is about right when compared to a guardsman model. Nephren-ka: Definately, I'll be going over the sculpting of the torso in great detail later in the tutorial. It's not as difficult as it seems once you get the hang of it. 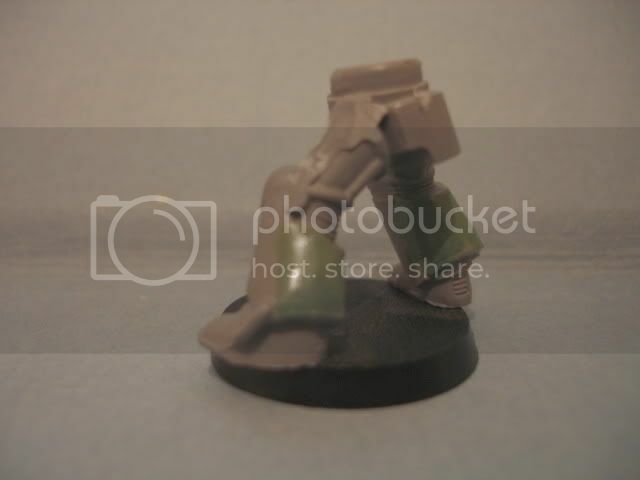 I worked up from a guardsman's height, Which I took to be 31mm = 5'10" . If you don't mind me asking, How tall did you decide they were? Edited by Tsuro, 05 April 2008 - 09:23 PM. THANK YOU SO MUCH!!! i can't wait for the rest. you're my hero Doghouse. Inspiring work. Can't wait to see more. 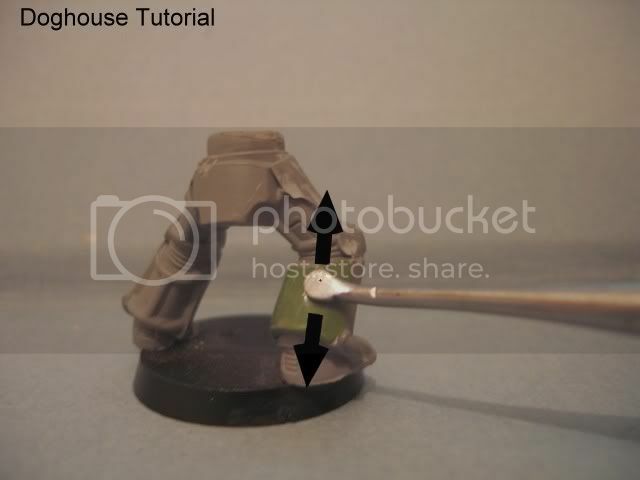 This is such a fantastic tutorial. The fact that players help eachother like this kinda warms my heart. can some1 show me how to sculpt the torso of the doghouse pattern astartes pls? You coming back to us Doghouse? Thanks guys you're all more than welcome. Don't worry I'm still here and working on the tutorial. I'll be updating it asap. I'd feel the same, only I have some spare from my DA. And [b]Doghouse[b], how far out do the torsos go? 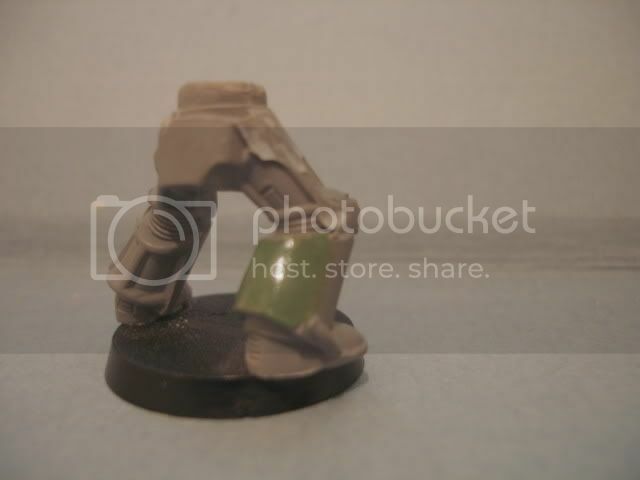 And for those who are sculpting deficient would modded Assault marine torso back work? 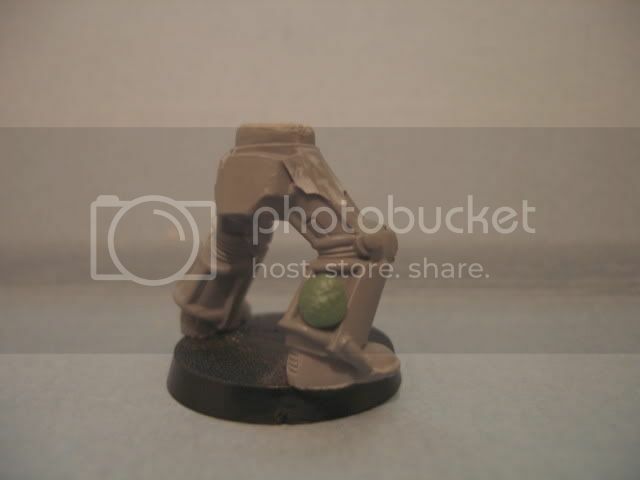 In Inquisitor, a Space Marine can take a krak grenade, pull out the pin, eat the grenade, throw the pin, and the thrown pin will actually kill a normal man, whereas the Space Marine won't even have indigestion.